So I got my new to me F150 inspected yesterday and noticed today there was a $10 window tint inspection fee tacked on... So I stopped by the inspection station and asked what the fee was for. Here in NC its required for aftermarket tinting, but I thought all mine was factory 'cause they all have the little Ford emblem in the lower corners, and the fronts are obviously lighter than the rears and you can easily see through all the windows... Evidently he gets this question asked relatively often because he was rather pissy in his explanation that "no US auto maker tints the front windows so all front tints are aftermarket." Then he goes on to explain that many dealers tint the fronts to help the sale. (1) Is it true that no US auto maker tints the fronts at the factory? (2) If the tint was done at the dealer, does this necessarily make it aftermarket? ALL my windows have the Ford tint emblem in the corners so to my logic, just because it may not have been done at the factory doesn't mean that it's also aftermarket. Last edited by suthrn; 01-08-2019 at 07:54 PM. Zero fords come factory with front window tint. "Aftermarket" tint is a film applied to the inside of the vehicle and if you roll your window down this is easy to spot. I have no idea what you're talking about as far as "Ford tint emblem". Sounds like something a salesman told you. I can plainly see a Ford marking on each window... Yours don't? It's possible that emblem is part of the window verses the tint. Last edited by suthrn; 01-08-2019 at 08:36 PM. The "Ford" emblem you see is etched into the window itself....more than likely the dealer installed the tint, which is still considered aftermarket. Different states and provinces have different laws regarding tint or no tint or how much tint. I have not seen any vehicle come from the factory with tinted front side windows (passenger or drivers door glass). It maybe be added after the fact and it is always easy to tell as it is a film added to the inside surface of the glass. Any “factory” tint the glass itself is tinted, not a film applied to the glass. Any item not installed at the factory is an “aftermarket” product unless it is a Ford OEM item installed at the dealership. Also because you bought it at the parts department of a Ford store does not mean it is OEM. many parts depts will sell led headlight conversion kits. nope not Ford OEM. Gatorback mudflaps are an official “Ford Licensed” product meaning someone else has made it and has been licensed by Ford to use their trademarked wording and images and are sold through many a Ford parts depts. BTW as a side note Gatorback mudflaps are mfg’d by one of my customers here in Alberta and are sold across North America. Last edited by Phyer Phyter; 01-08-2019 at 08:51 PM. I'm in NC also and always have the fee. I tinted my front windows to the legal limit and left the back as they came from Ford. He is correct in that no cars come with the front windows tinted because there are some states that don't allow it. The place I go to normally has a big sign posted warning that it is a felony in NC to pass a car inspection if the windows are beyond legal limit so not to ask. He told me people try all the time to get him to pass their cars. I'm in NC and have my fronts tinted to legal limit (35%) and have never been charged for a tint fee, just the $13.60 for inspection. While it may not be in essence what we have all come to know as window tint. 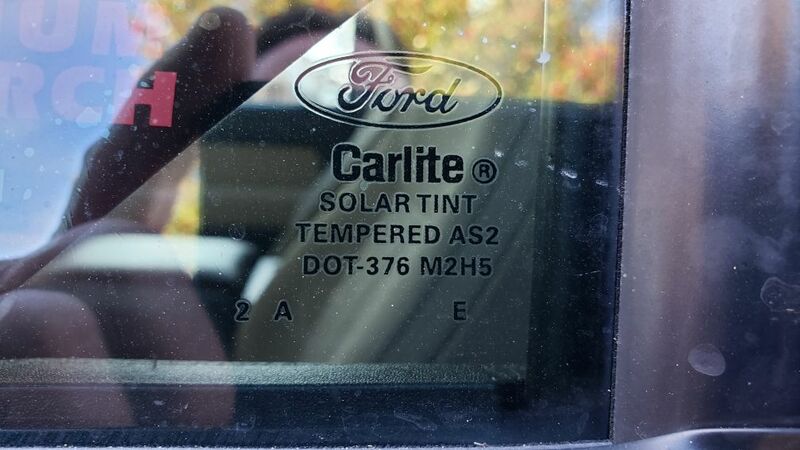 The people that supply Ford it's glass (Carlite) send them to the plant tinted. So yes they do come from the factory with tint. Granted it may not be very dark but OEM it is. Pic of my driver door front window bottom right corner, and no It's not dealer add on, I bought my truck brand new with nothing extra added. I went and looked at our shop trucks windows, same thing all of them. Last edited by Rnlcomp; 01-09-2019 at 10:58 AM.